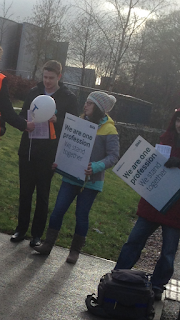 Junior Doctors on the picket line today at the Royal Stoke University Hospital were in a defiant mood. Their confidence has grown since the last strike in January. At times the noise made by the Junior Doctors and their supporters with singing and klaxons was so so loud that even the horns of passing cars could not be heard! There were more Junior Doctors this time than in January. After and hour or so about twenty of the Doctors went to set up a second picket on another entrance. A firefighter in uniform turned up to the picket with cakes and a message of support for Doctors on strike and tea and coffee was brought out of the hospital by other NHS staff. The pig-headed approach by 'health' minister Jeremy Hunt has angered not just Junior Doctors but the vast majority of NHS staff and millions across the country as well. Joe Cairns, an ex-miner who did twelve months on strike in 1984/85, had not come alone to show support but brought his whole family as well! TUSC supporters were also there to show support and helped on campaign stalls in support of Junior Doctors last Friday and Monday and also today.